Waste Challenge: A mining company with a strong commitment to environmental health and safety acquired a producing mine in Central America. The large, well-established property had infrastructure including power and water supply, warehousing, maintenance facilities, a laboratory, workforce housing and a landfill. However, the new owner wanted to update the mine’s practices including its reliance on landfilling to avoid future potential environmental issues. 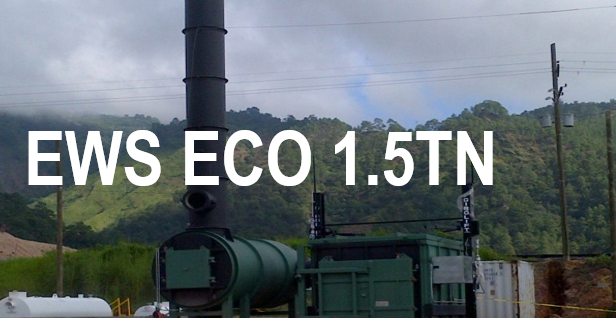 ECO Solution: The mining company selected the Eco Waste Oxidizer as the new on-site waste disposal solution. The technology combines waste gasification and high temperature thermal oxidation to ensure complete destruction of all waste generated on-site. Remaining residual requires no further treatment and can be safely deposited without the need for future land remediation. Special Features – Waste Fuel Recovery: The Waste Oil Burner package, included with the system, allows the mine to process used lubricating oils (from vehicle and equipment maintenance) reducing transport costs for disposal. The energy supplied by the waste oils also reduces the mine’s reliance on virgin fossil fuel sources for treating waste. Sustainable Benefit: Reduced Risk of Environmental Impact. Waste is reduced to a non-toxic ash residual that will not pollute water or land via leaching or run-off – problems associated with landfilling untreated waste. Thermal conversion of waste using the Oxidizer also completely avoids decomposition of waste which would otherwise generate methane gas (a powerful greenhouse gas).